← Can you spy skyline #5? 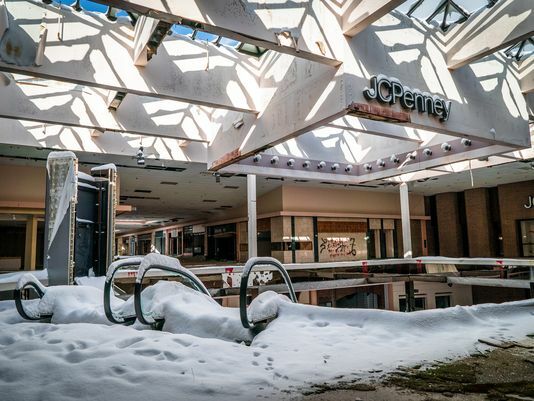 Check out this weblink to wintry post-apocalyptic images of an abandoned shopping mall (Rolling Acres Mall) near Akron, Ohio. The photos were taken by photographer Johnny Joo. The mall opened in 1975 and the last stores closed in 2013. 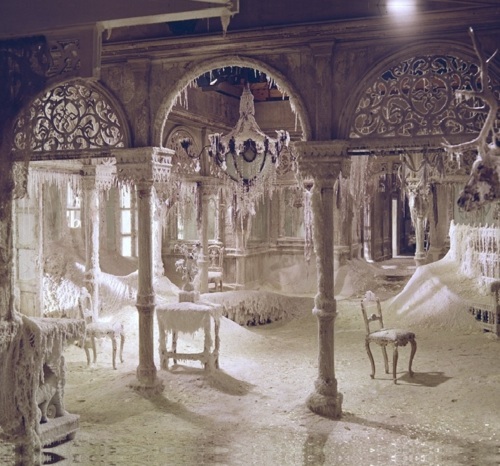 It almost resembles a modern-day version of the ice palace scenes from the film Dr. Zhivago. Sad, that some sort of beneficial use cannot be found for this mall and other ones across the country instead of becoming gigantic, blighted, wastes of land with so many empty stores and vacant parking lots. At the very least, demolish it so the property is ready for redevelopment. Perhaps, preliminary redevelopment plans should be required of applicants when original permit approvals are sought, so that such structures are not allowed to just wither away because someone somewhere thinks they are no longer profitable enough. Call me naive or pie-in the sky, but to this planner, an applicant’s civic duty (short and long-term) to the community should be part of the equation and should be made part of the conditions of approval, thusly transferring responsibility to future owners, as well. This entry was posted in adaptive reuse, architecture, art, cities, civics, consumerism, economic development, economic gardening, film, geography, history, infrastructure, land use, movies, pictures, planning, spatial design, urban planning, visual pollution, zoning and tagged adaptive reuse, Akron, civics, conditions, Dr. Zhivago, film, history, land use, movies, permits, photos, planning, redevelopment, retail, Rolling Acres Malls, shopping malls, urban planning, zoning. Bookmark the permalink. Eerie winter images of an abandoned mall. I can’t believe that such important investmen now is abandoned. Many things could happen, but anyway, a landuse plan had to be the support to built it. Perhaps the authority was not included in the process or a very futurist view was the reason, thinking in the future development of the area. It is interesting to know the true reason. My guess is it all comes down to the bottom line – profits.Sure seems like an enormous waste.